The Lonestar Choppaz is an elite group of young individuals that are highly skilled in the percussion realm of marching band and percussion ensemble. This elite group was founded by Joseph Burleson and Donta Harris with the sole purpose of taking drumming to the next level and gathering the best percussionist from all over the south to combine as one single drumline. 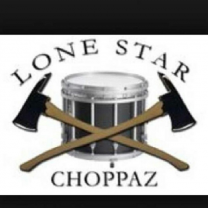 Since its inception in 2004, The Lonestar Choppaz have participated in various competitions including “The Texas Big Beat”, High Noon Drum Competition, and the Ross Shaw Sterling Drummer’s over Houston, just to name a few. Also, they have even performed half time shows for such professional teams as our very own Houston Dynamo and the University of Houston Men’s basketball Halftime show. Not only is the Lonestar Choppaz instrumental in the entertainment capacity, but more so in the educational. This group has put on countless training camps designed to aspire inner city youth to embrace the arts of music by becoming percussionist. Various camps have been held annually in cities such as Austin, Houston and Dallas.